Details: The Official Premier League 2002 sticker Collection. THERE IS A SPECIAL UN-NUMBERED COMPLETION STICKER WHICH GOES ON THE INSIDE BACK COVER TO COMPLETE THE SET. THERE WAS ALSO AN ADDITIONAL 80 SMALL STICKERS FOR A SUPER STARS INSERT IN THE CENTRE OF THE ALBUM. THESE COULD BE OBTAINED FROM PACKS OF WALKERS SNACKS For 2002, Merlin have stopped at nothing to bring its collectors the best F.A. Premier League sticker collection ever. This season’s superb-looking album boasts a detailed focus on 18 players for each team, great features and more must-know player information than ever before. As well as a great new album layout and cutting edge design, there’s also 360 superb new player stickers to collect that, for the very first time, feature a genuine print of each player’s signature in metallic silver and gold ink. There’s over 90 pages of top-class F.A. Premier League action, making it an absolute must for the most fanatic Barclaycard Premiership fans everywhere. 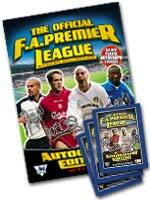 Premier League 2002 is packed full of the superstars that make the Barclaycard Premiership one of the most exciting league’s in the world and is an ideal gift for football fans of all ages.